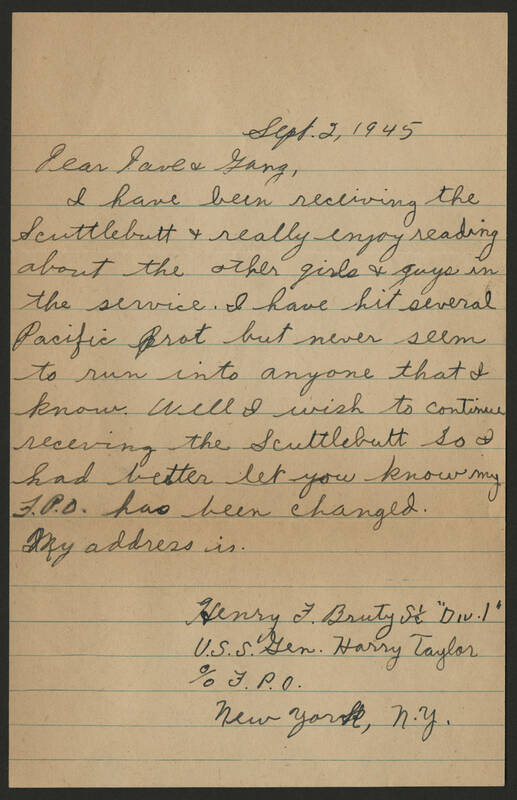 Sept. 2, 1945 Dear Dave + Gang, I have been receiving the Scuttlebutt + really enjoy reading about the other girls and guys in the service. I have hit several Pacific (Brat) but never seem to run into anyone that I know. Well I wish to continue receiving the Scuttlebutt so + had better let you know my F.P.O. has been changed. My address is. Henry F. Bruty S(%) "Div. 1" U.S.S. Harry Taylor % F.P.O.